Well, summer is coming to a close, kids will be heading back to school next week and soon we’ll be watching as the leaves start changing colours and Autumn sets in. We don’t know about all of you but we LOVE Fall. Today we’re sharing five ways to get Autumn inspired! Also just a reminder, we will be closed Monday September 7th for Labour Day. This past weekend we had a booth at The Aurora Farmers’ Market & Artisan Fair! We chatted with a few familiar faces and meet new customers as well. It was an amazing opportunity to show Aurora what we’re all about here at The Millionaire’s Daughter! We were incredibly impressed with the vendors and coordinators of the Aurora Farmers’ Market. It truly shows how well loved local vendors are by the sheer number of shoppers who make the farmers’ market a must almost every Saturday morning May through October. Season to season we’re all about small changes. Adding a few autumnal throw pillows, changing your coffee table decor or re-decorating your fireplace mantel are all small changes that will get you (and your home) inspired for the change of season! Autumn calls for warm, rich colour palettes; deep reds, berry tones, army green and golden yellows! We are now accepting Fall Decor Consignments! At all locations our consignment hours are Monday 10 – 4, Tuesday 10 – 4, Wednesday 10 – 4 and Saturday 11 – 3. It seems that after Labour Day time just takes off so quickly. Soon enough it will be Thanksgiving and then Christmas and then a whole New Year to start thinking about! We have customers in the store that are already shopping for Christmas, if you can believe it! Even if the holidays aren’t yet on your radar we want to quickly mention a few dates you should keep in mind for September! 5. Continue to enjoy your outdoor space! Just because the weather is cooling down doesn’t mean we have to retreat indoors and prepare to hibernate for winter. Enjoy the sweater weather, falling leaves and crisp Autumn air! 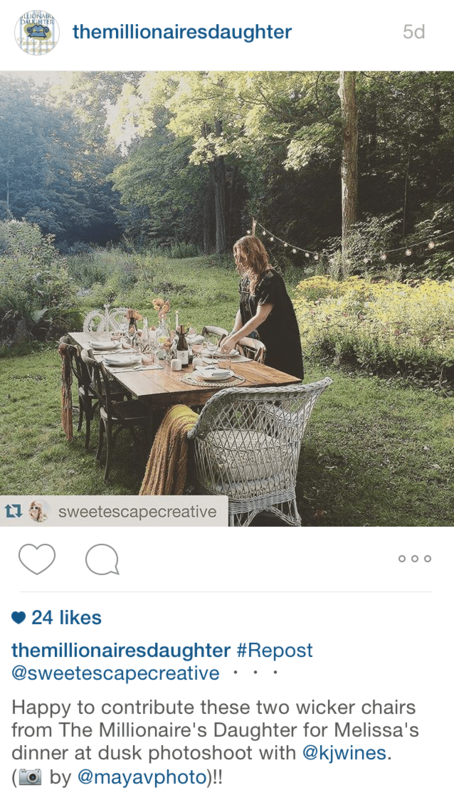 We were happy to contribute two lovely wicker chairs from The Millionaire’s Daughter for The Sweet Escape’s Dinner at Dusk photoshoot. Check out the sneak peak – behind the scenes pictures below. We are loving this Fall-inspired outdoor dinner party! Thanks for reading! What is your favourite part of Fall?